Like the West’s support of sectarian terrorists across the Middle East, including Al Qaeda, it has found the most despicable elements in Ukrainian society to lead “revolution” for the sociopolitical reordering of Eastern Europe. As the dust settles, and the West’s proxy regime finds itself safely entrenched in Kiev, Ukraine – the Western media can now finally recuperate some of its lost legitimacy after months of denying the obvious – that armed Neo-Nazis led the so-called “Euromaidan” uprising. A BBC Newsnight short titled, “Neo-Nazi threat in new Ukraine,” reveals xenophobic Jew-hating nationalists, armed and leading the mobs in Kiev, directly contradicting months of Western media narratives portraying the rabble as aspiring for “freedom,” “democracy,” and “closer ties with the West,” with the most absurd example being the “I am Ukrainian” propaganda reel. Far from a “pro-democracy” uprising, the “Euromaidan” was yet another case of Western engineered regime change leveraging the good intentions of the ill-informed to mask the covert backing of ugly armed extremists, just as it had done all across the similarly engineered “Arab Spring” in 2011. In the light of the BBC’s report, confirmed intercepted phone conversations between the EU and Estonia regarding the Ukrainian opposition’s hiring of snipers deployed against both police and protesters takes on a new degree of veracity with deepening implications. It also reframes US Senator John McCain’s taking to the stage in Kiev, side-by-side with these overt Nazis as an abhorrent, shameful act bordering on treason and material support of terrorism. Russia invaded Ukraine over the weekend, justifying its incursion by claiming it needed to protect Crimea’s ethnic Russian population from supposed neo-Nazi extremists. This was pure propaganda, of course—Vladmir Putin has been keen to annex land that used to be part of Russia, as he did in Georgia in 2008, and seems to think that the Ukrainian army will and should immediately surrender to the Russian one. Still, Putin needed a story to spin, no matter how full of holes, and thus the neo-Nazi claims. But as it turns out, Crimea’s streets are not exactly paved with extremists—a fact that has proven troublesome for Russian state TV channels looking to find token far-right bogeymen. While the Daily Beast claims Russian state TV is having trouble finding Neo-Nazi extremists in Crimea, it appears the BBC is falling all over them in Kiev. Their existence in the capital of Ukraine, the fact that they are confirmed to be armed and poised to seize and consolidate greater power, is an overt threat to both the people of Kiev, and the rest of the Ukrainian population, and is cause of grave concern for Ukraine’s neighbors – considering the Nazis’ blood-soaked, genocidal origins. In this light, we see precisely what Russia is attempting to counter, but is being wholly condemned by the West for standing up against. For the West, its ability to ally itself with the most abhorrent ideologies ever conceived by mankind indicates that the supposed principles its society is based upon are merely facades behind which it couches its true ambitions – hegemonic expansion, no different than the violent extremist helping-hands it regularly finds itself collaborating with around the world. The West Drawing the Long Knives Already? The BBC’s sudden “honesty” regarding brigades of armed Nazis infesting western Ukraine, however, is not the result of the British state propaganda arm examining its journalistic conscience, but rather an attempt to throw off extremist thugs that will only, from now on, become a liability for the West’s ambitions in the Eastern European nation. The West would most likely prefer to replace armed Neo-Nazis with NATO forces, professional mercenaries, and a proxy force of Ukrainians trained and led by Western special forces and intelligence operatives. 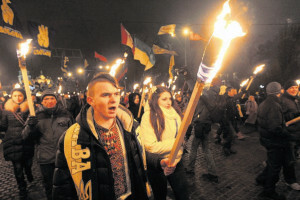 Just as the West has done in Afghanistan, where it used sectarian extremists and terrorists to wage a proxy war against the Soviet Union in the 1980′s, only to end up turning on their “allies” from 2001 onward – the West will use the Neo-Nazis of Kiev only for as long as absolutely necessary before turning on them and dumping them. The BBC’s short piece exposing the repugnant nature of the forces that in fact led the so-called “Euromaidan” uprising is perhaps the first step toward achieving this goal. Those watching the Ukrainian crisis closely will want to monitor the posture the West takes regarding their fascist armed, militant proxies, and be aware of preparations the West might be making to replace them with a more professional, as well as presentable, armed front to consolidate and hold gains made during the violence and chaos that has consumed Kiev for the past several months. Contributed by Tony Cartalucci of New Eastern Outlook.